Encontrei referências a este livro no blog da Rosa. Vou gostar de o folhear! Não podia deixar de partilhar aqui. I found this book in trought Rosa's blog. I had to share it here. I will love to have it and enjoy every single page! "(...) this book is a jewel. Ellen Korth has visited more than 40 women and also men, who devotedly crochet, knit, bobbin lace and spin at home like there is no tomorrow. The book itself is a unique top performance of the bookbinding craftsmanship." 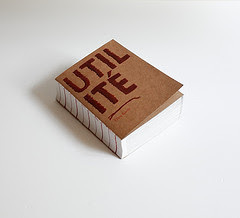 Thanks Ellen Korth for having created Utilité. More about Ellen Korth here.